Interactive FAQ plugin. It lets your visitors ask questions directly on the page. This plugin lets your visitors ask questions directly on the page. They will be notified by mail when you answer the question. You can also use it without the interactive part by simply adding questions and answers in the backend and then displaying it in the frontend. 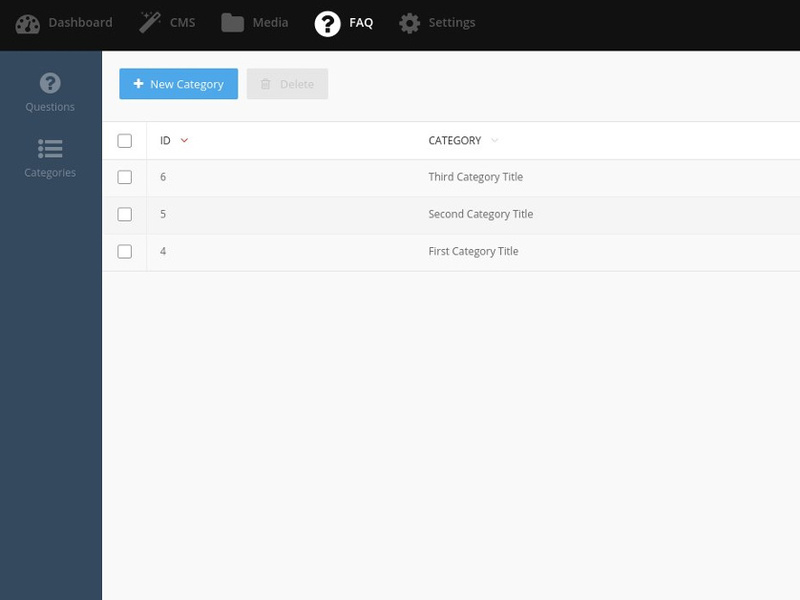 You can divide Q/A into categories of your choice. This is a FAQ plugin so one Question can only have one Answer. This plugin is still a bit limited but I plan on developing it in the future. For installation, usage and configuration instructions see Documentation. FAQ Plugin Icon is based on IcoMoon - free set. Type RedMarlin.Faq and install the plugin. Unpack it to plugins/redmalin/faq directory. Logout and login into the backend, and the plugin should now be installed. There is not much to configure, all the settings for backend display are in components. Go to Settings->Mail->Mail Templates to edit them. For available variables list check the Documentation tab. All questions asked through the site are automatically added as Not public (invisible on the site); the category is set to 0. Email notifications for answered questions are not sent automatically, you need to click on the button after saving the answer. Email left by visitor to be notified is deleted from DB once the notification is sent. You can use this plugin in two ways. You can add questions and answers yourself (disabling the visitors questions) or you can let your customers ask the questions and you answer them from admin. 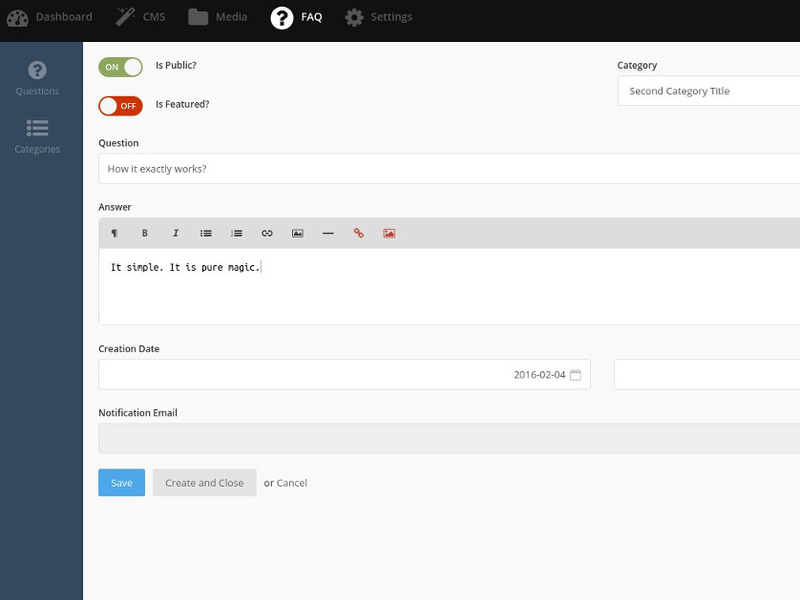 To let your visitors ask questions just add the FaqAsk component to a page. To add questions and answers you first need to create a category. For adding questions, answers and categories go to FAQ top menu. To make questions visible on the page you need to turn on Is Public switch. You can also feature a Q/A by turning on Is Featured switch. To notify you visitor about answer to his question being published first save the answer and then click on "Notify about answer" box. The notification will be sent and email will be deleted form the DB. This prevents storing your visitors emails forever and sending the notification twice. To sort questions for given category go to the category menu and then edit category. Click on the Reorder Questions in this category button. Displays a form on your page that lets your visitors ask the question directly. There are no properties for this one, just add it to your page and then insert the component. Displaying Ask a question form in right column. Displays list of Q titles with links to FAQ Page. Displaying Featured Question list in footer. Displays list of newest questions with answers from all categories. questionNumber - Number of newest Q/A to show. The default template contains div element with specially generated id to be an anchor for FaqFeatured component links. Show 10 newest Q/A on page. Displays list of Q/A from a given category. Page that lets you display all Q/A for a given category. You can set category in URL, ie. faq/cartegory/1 will show all Q/A for category with id 1 (you can check category id in the backend in the Category list). Displays list of Q/A from all categories. Page that lets you display 25 last Q/A from all categories. If you need to show more questions just set limit to something big enough, like 999. Thanks, very helpful. Can you add the feature to re-order the list? If upgrading from 1.0.0 to 1.0.1 or above, to have manual/user sorting function you need to use FaqList component and set Sort Order property to User order. Then you need to go to the category->edit category and once there click on Reorder questions in this category button. You need to drag/move all the questions to make sorting work as the initial value for user order is 0 for all existing questions.